Recently, I came across that label again. This time it was not on the front cover of a catalog. Instead, the label, itself, was a product advertised in a trade catalog from 1908. The catalog is entitled How to File Catalogs Y and E System Series No. 1468 (1908) by Yawman & Erbe Mfg. Co.
Yawman & Erbe Mfg. Co., Rochester, NY. How to File Catalogs Y and E System Series No. 1468, 1908, front cover, people working in an office with a close-up view of a catalog being filed in a drawer. Yawman & Erbe Mfg. Co., Rochester, NY. How to File Catalogs Y and E System Series No. 1468, 1908, title page and two images of the factories. 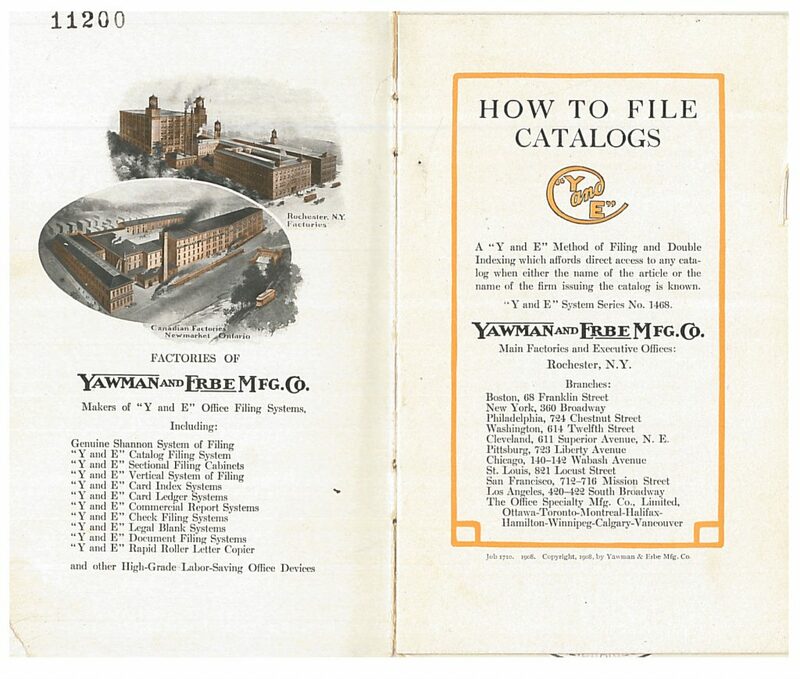 It begins with an explanation that catalogs should be organized and filed appropriately so when needed they are easily located instead of “jumbled between division cards on an improvised shelf.” Yawman & Erbe Mfg. Co. offered a catalog filing system using index cards and labels as well as sectional filing cabinets to house the catalogs. 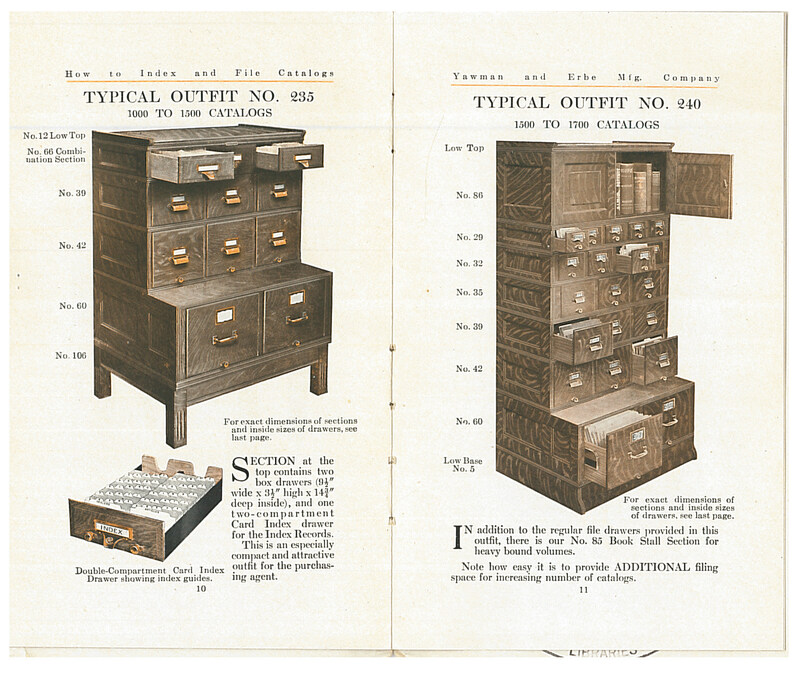 The sectional filing cabinets were available in a variety of sizes because trade catalogs come in a variety of sizes. It was possible to stack different size sections of drawers on top of each other. Sections with small drawers could be stacked on top of sections with large drawers. That way it was easier to store catalogs of all sizes. There was even a section called the Book Stall Section for heavy bound catalogs to stand upright, as shown in the below right illustration. Yawman & Erbe Mfg. Co., Rochester, NY. How to File Catalogs Y and E System Series No. 1468, 1908, pages 10-11, sectional filing cabinets. 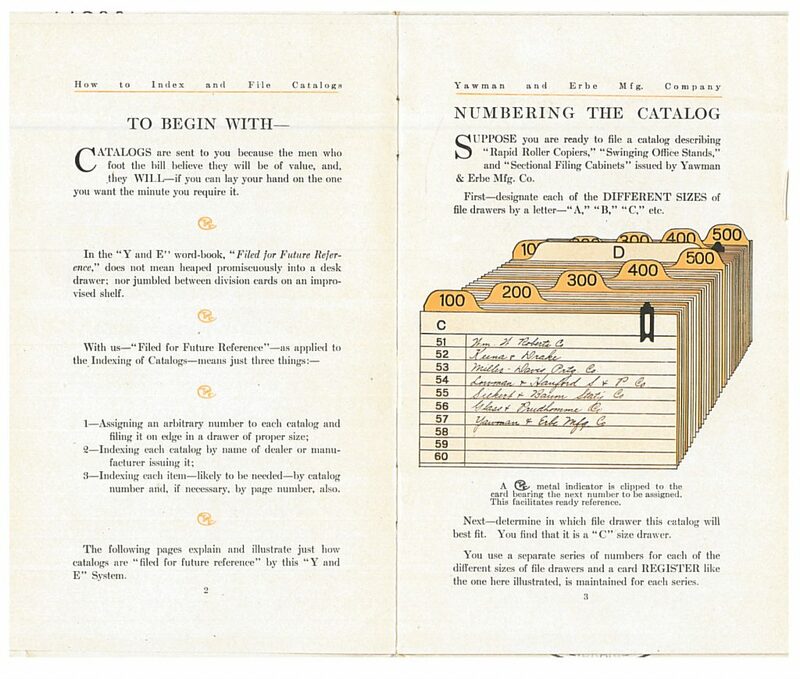 The catalog filing system involved card registers, index cards, and gummed labels, similar to the labels sometimes found on catalogs in the Trade Literature Collection. Each size drawer was assigned a different letter, such as A, B, C, etc. Drawers labeled A might have been for small catalogs while drawers labeled C might have been for large catalogs. Each drawer size was assigned a separate series of numbers with corresponding card registers. 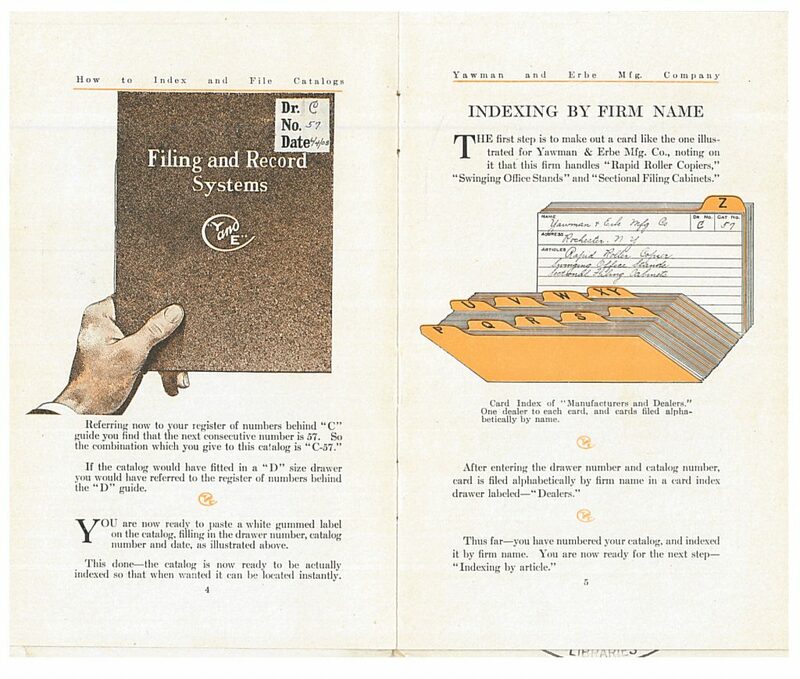 The card registers included numbered lines for writing the company name, or manufacturer, of each catalog filed in each drawer. For example, it might have been determined that, due to its size, a particular catalog fit best in a Drawer C. On a card register for Drawer C, the company name of the catalog was written on the next available numbered line, as shown below, and then filed in that spot in the drawer. Yawman & Erbe Mfg. Co., Rochester, NY. How to File Catalogs Y and E System Series No. 1468, 1908, pages 2-3, card register. Once the catalog was assigned both a drawer and number, a white gummed label was attached to the catalog. In the illustration below, the gummed label is on the upper right corner of the front cover. This particular label noted the date and the location the catalog was assigned to: Drawer C, Number 57. Yawman & Erbe Mfg. Co., Rochester, NY. How to File Catalogs Y and E System Series No. 1468, 1908, pages 4-5, gummed label attached to front cover of catalog and card index for manufacturers and dealers. Next, each catalog was indexed two ways, by company name/manufacturer and by type of products/articles advertised in it. 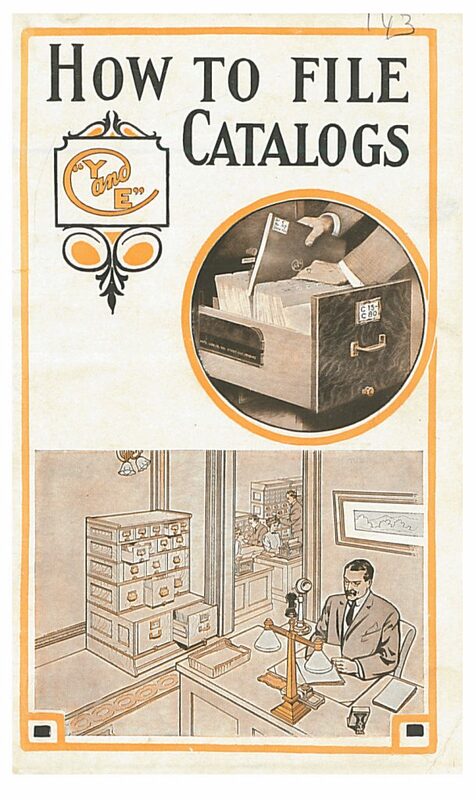 To index a catalog by company name, a card was completed noting company name, location of catalog in the filing cabinet, and types of products it advertised, as shown in the above illustration. The card was filed alphabetically by company name in the “Dealers” index. 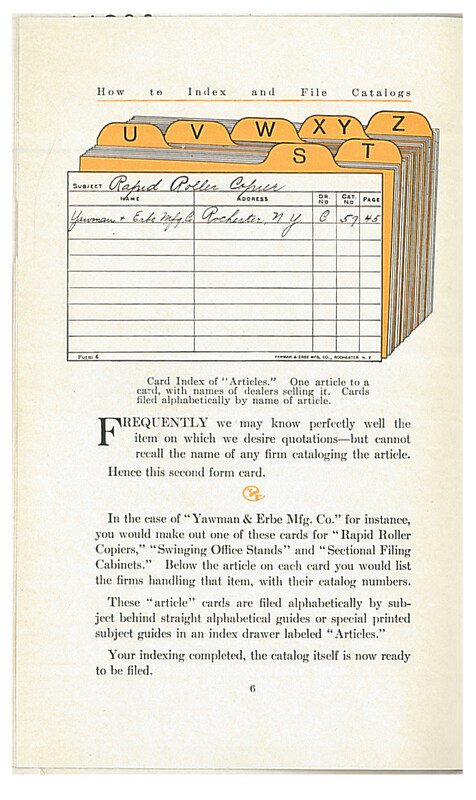 To index a catalog by type of products or “articles” advertised, a different type of card was completed. At the top of each card, a specific product was written on the “Subject” line. There were also lines to record names of companies that sold the product, locations of those catalogs in the filing cabinets, and page numbers where that product was found in the catalogs. The card was filed alphabetically by subject line in the “Articles” index. How to File Catalogs Y and E System Series No. 1468 (1908) and other catalogs by Yawman & Erbe Mfg. Co. are located in the Trade Literature Collection at the National Museum of American History Library.